In past years, the McDermott Will & Emery Nanotechnology Affinity Group has investigated trends in nanotechnology patent literature as a means of identifying research trends, pinpointing industry leaders and clarifying the importance of the United States in this technology revolution. We offer this 2014 Special Report as a continuing study of trends observed in our 2013 and 2012 reports, and also present a renewed focus on trends in the Energy sector. The total volume of published nanotechnology patent literature increased 5 percent in 2013 and has more than tripled since 2003. The number of U.S. patents issued in nanotechnology was more than 6,000 in 2013, a 17 percent increase over 2012. About 54 percent of the nanotechnology patent literature published in 2013 was assigned to U.S.-based entities, followed by South Korea at 8.3 percent, Japan at 8.0 percent and Germany at 5.8 percent. The top-three assignees of the nanotechnology patent literature published in 2013 are primarily in the Computers and Electronics sector. The other two assignees rounding out the top five are universities in China and the United States. The nanotechnology patent literature in the Energy sector increased 8 percent in 2013. For nanotechnology patent literature as a whole, Energy Storage, Photovoltaics and Petroleum Exploration emerged as the top three areas of focus in the Energy sector, each with similar growth since the early 2000s. In the more-focused area of graphitic carbon-based nanotechnology, Energy Storage dominates the Energy sector. Nanotechnology innovation for Photovoltaics appears to have stagnated or is on the decline. This could indicate reduced interest in this category or a transition from research to commercialization in the sector. Similar to computers, nanotechnology is both an enabling technology and a technology sector in its own right. Nanotechnology is prolific in the research and development of almost every economic sector, from aerospace to medicine to energy. 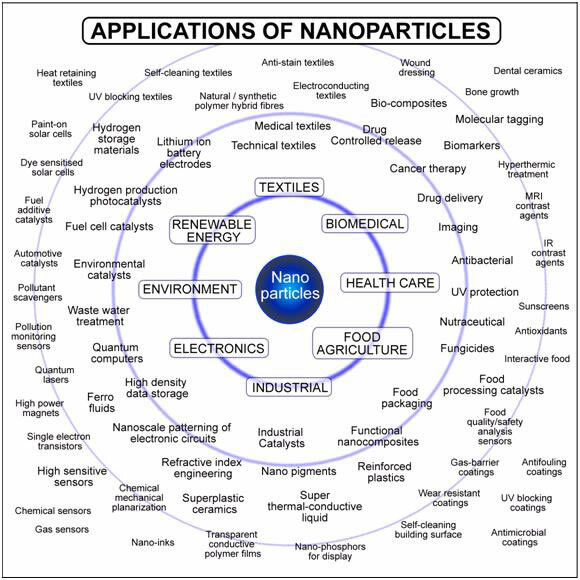 Further, many commercial products incorporate nanomaterials or nanotechnology principles. For example, incorporation of silver nanoparticles into wound dressings can provide antibacterial properties. Manufacturers of sports equipment and automobiles can use nanoparticles to decrease the weight and increase the strength of their products. Paints often include nanoparticles to enhance the color, reduce or eliminate volatile organic compounds, and stop bacteria or fungal growth, which may be particularly useful in hospitals and clinics. Adapted from Takuya Tsuzuki, "Commercial scale production of inorganic nanoparticles," International Journal of Nanotechnology, 6 (2009) 567. 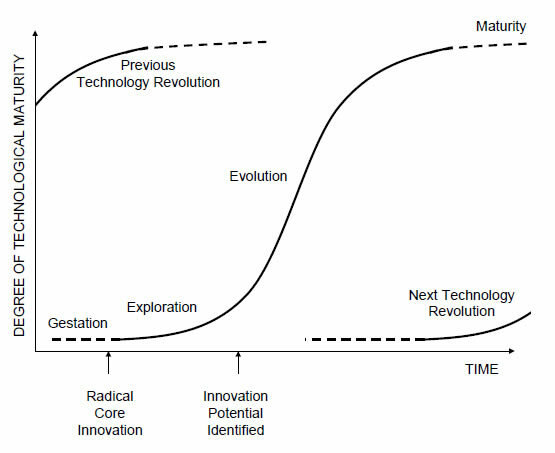 Technology revolutions generally follow an S-shaped trajectory from gestation to exploration that is typically marked by core innovations. For nanotechnology, such core innovations include the invention of the scanning-probe microscope and the discovery of the buckminsterfullerene. Subsequently, as the innovation potential of the technology is identified and accepted, exploration transitions to evolution and eventually maturity as the next technology revolution enters the exploration phase. Adapted from Nieto, M., et al., “Performance analysis of technology using the S curve model: the case of digital signal processing (DSP) technologies,” Technovation, 18(6-7), pp. 439-457. Modern history can be divided into several periods of technological revolution that developed in different regions throughout the world, and which, interestingly, correspond to the regions of global power for the given time period. From approximately 1780 to 1840, the steam engine, the textiles industry and mechanical engineering were born in the United Kingdom. Then, from about 1840 to 1900, railways, electricity and the steel industry began in England, Germany and the United States. The third technology revolution, spanning from about 1900 to 1950, brought electrical engines, heavy chemicals, automobiles and mass production of consumer durables, and has been largely based in the United States. Finally, from about 1950 to present times, the Pacific Basin, Japan and the United States (the state of California, in particular) have been the epicenter for the fourth technology revolution, involving synthetics, organic chemicals and computers.2 We are now in a unique time, as the world transitions into a fifth technology revolution based on nanotechnology and molecular manufacturing. 1 National Nanotechnology Initiative at www.nano.gov. 2 Carlota Perez, Technological Revolutions and Financial Capital (Edward Elgar Pub, April 2003).